- "Awakening the Lotus" chakra-based meditation, and more as a complement to one's existing yoga practice -- or used on its own -- Drops of Nectar will serve as a valuable resource for anyone seeking to explore the healing traditions of yoga. Full of interesting and beautiful visualizations and concentration techniques as well as offering some simple and heart opening posture flows this will add new dimensions to your teaching or your personal practice. Highlights include a detailed chakra concentration exercise and a simple chakra breathing technique, a rapid and comprehensive yoga nidra (guided relaxation) that explores the outer body before taking you deep within, a self guided deep tissue massage and tension release exercise that is intense and unusual, and a gentle focus on the moon in various places throughout the program. Any one of these teachings would be worth the price of the set but here they are all immediately available to you. Plus, throughout the CDs the beautiful music of Ben Leinbach enhances and encourages our inward journey. Like great teachers before her, Shiva Rea gives more than she needs to and we can all benefit. Shiva Rea, M.A., is a leading teacher of transformational Prana Flow Yoga and Yoga Trance Dance™. She began exploring yoga at the age of fourteen as a way to understand her name, given to her by her father, a surfer and artist. Her studies in the Krishnamacharya lineage, Tantra, Ayurveda, Bhakti, Kalaripayattu, world dance, yogic art and somatic movement infuse her approach to living yoga and embodying the flow. She is known for bringing the roots of yoga alive for modern practitioners in creative, dynamic and life-transforming ways and for offering the synthesis form of vinyasa flow out in the world. As a global adventurer, she has led over 70 retreats and pilgrimages nationally and internationally as well as served as a creative catalyst for conferences, festivals and actions for the environment, yoga and the arts including the third annual Yogini Conference of Kripalu and Omega. 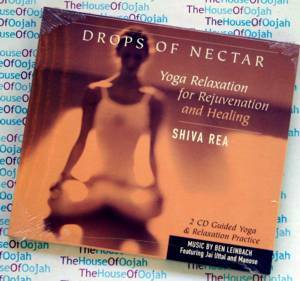 Shiva writes for Yoga Journal and is the author of award-winning CD's and DVD 's to empower and transform yoga home practice. She lives with her family near their favorite surf break at Sunset Beach in Pacific Palisades, California.